Thank you to the anonymous commissioner!! I was totally not expecting the cameo that appears in this story, but it made me yell so hard because C’MON, DARLING!! SWEETIE!! WHY DO YOU HAVE TO BE LIKE THIS!! Hahaha, anyway, as always I love Setsuka’s writing and Dusk is so good at feeding me. This entry was posted in Drama CDs, Kankinkon and tagged Dusk, R18, Vol.16. Thank you to the same anonymous commissioner again. Here is Part 2 of being completely and utterly spoiled by Dusk. I have so many theories on where Löwe’s one is going to go and how it’ll make me bawl my eyes out but I’ll leave that to the end. Please note: the YouTube version will be taken down on June 30th (but it will be added to the DLsite version). This entry was posted in Drama CDs, Weltalles Oukoku Monogatari and tagged Dusk, Kuzai Tsubasa, R18. Thank you to the anonymous commissioner. I CAN’T BELIEVE DUSK SPOILS US SO MUCH. How is this a “short” drama? It expands the world so much and continues this amazing story, plus it’s completely free. Please note: the YouTube version will be taken down on June 30th (but it will be added to the DLsite version). ALSO! We’re still 300ish DLs away from unlocking the 1500 DL reward which is Löwe’s short drama track, so you know what this means. Gotta advertise this series to everyone you know LOL. Beep boop R18 warning as usual. 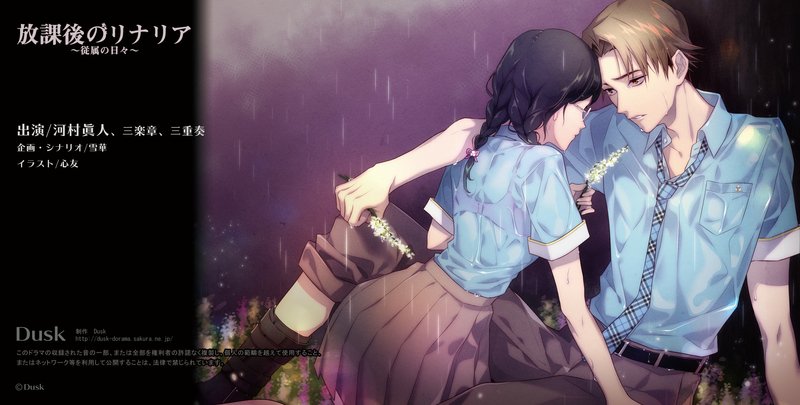 This entry was posted in Drama CDs, Weltalles Oukoku Monogatari and tagged Andou Yuki, Dusk, R18. The last reward at 1800 downloads is another short story! Translation below. This entry was posted in Drama CDs, Kankinkon and tagged Dusk, R18, Vol.1. Annnd another free short drama track was released as a reward for hitting 1600 downloads. This one is a short one but beware R18 language! This short drama also uses the dummy mic, so don’t forget your headphones! Here is another free short drama track released as a reward for hitting 1500 downloads. Remember, Touji is extremely problematic and there’s gonna be R18 language! This short drama uses the dummy mic, so don’t forget your headphones! A short story was unlocked after 900 downloads and the translation is below. Also, I just want to point out that there’s a manga of Touji seeing and falling in love with the heroine as a reward for 1400 downloads. But I don’t do manga scanlations and the thing is on Pixiv, under the account of the artist for the Kankinkon series, so please head over there if you want to look at it! There was a free short drama track released as a reward for hitting 300 downloads. Obligatory warning for Touji being his usual gross self LOL and for R18 language! By the way, this short drama wasn’t recorded with a dummy mic so you don’t need headphones (though given its contents… you still probably want to wear some LOL). The other free short dramas use a dummy mic though. Okay, we’re back to the first drama’s bonus content again and this officially kicks off the second week of Touji appreciation month. February is the month of love because of Valentines, right? |D Here we have the cast talk! This entry was posted in Drama CDs, Kankinkon and tagged Dusk, Makino Hideki, Vol.1. Okay, so technically this is a short story from the sequel of the drama I translated yesterday. However, I love this short story so much and it becomes one of the most crucial points in Touji and his heroine’s life and gets brought up constantly (and never fails to destroy me) so I had to translate this right after his first drama, despite having to jump out of order to do so. R18 language abounds in the story below so watch out! This entry was posted in Drama CDs, Kankinkon and tagged Dusk, R18, Vol.2. What awaits is only despair. On a certain day, during the way home, the heroine was suddenly dragged into a car. Held down by an unknown man, who called himself “Saijou”, the heroine shook in fear and was told this. Inside the car, where help does not come, the heroine was thoroughly assaulted by Saijou. Enduring the humiliation, just as she thought she would finally be released, Saijou started to talk about a “wedding”. SURPRISE!! You can pick up this drama at the English DLsite or the Japanese DLsite. All the download rewards have been reached already. For those who are curious about this man and want front row seats to my ongoing meltdown over him I have a Twitter moment dedicated to him at Ili’s Gross Touji Diary. I was running out of things to say during the Very Obvious countdown LOL. Let’s be real, is anyone actually surprised by my Valentine’s pick for this year? Because I’ve been screaming about Touji for what feels like forever and it’s not going to stop any time soon if Dusk keeps spoiling my boy. I love him so much and even though I’m not sure I’ll ever translate all of his materials (there’s so much) I’ll do my best to tackle some here! To be honest, I’m mainly doing these translations to motivate myself to check out all his free short dramas. IT TAKES ME FOREVER TO GET AROUND TO ANYTHING TOUJI-RELATED BECAUSE I JUST KEEP COLLAPSING INTO A PUDDLE OF TEARS OVER HIM. I know, I know, he’s a dumpster-on-fire man and deserves a place in the deepest pits of hell but oh MAN is his relationship with his heroine one of the best carefully crafted hate/love relationship I’ve ever had the pleasure of experiencing and straight up my alley.